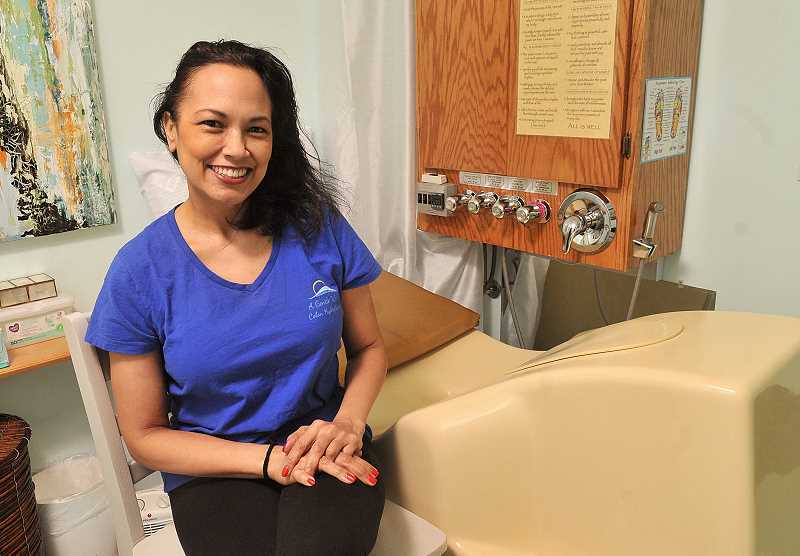 Macy Galla of West Linn has opened A Gentle Wave Colon Hydrotherapy spa in her West Linn home. Got digestive issues? Many Americans do, but you aren't likely to hear much chatter about constipation and other issues in polite conversation. Unless you are Macy Galla. Galla is an Internal Cleansing Specialist and founder of A Gentle Wave Colon Hydrotherapy. The West Linn resident invites all to experience the benefits of a cleansing colonic experience. Galla says she discovered the benefits of colon hydrotherapy through her personal health journey. In 2010, after months of tests and doctor visits, her doctor could not determine what was ailing Galla and diagnosed her with chronic fatigue syndrome. "I knew that meant I'd just get a prescription and that would be that," she said. She began her own extensive research and discovered a treatment that was reportedly working which involved coffee enemas and consuming freshly squeezed juices of organic fruits and vegetables and some vegan foods. Having nothing to lose she decided to give it a try. "It was supposed to take a year to restore health but I was back to my old self in six months," she said. The protocol was too strict to sustain long term but she continued with colon hydrotherapy treatments, eventually following her passion to begin training with mentors Tara Alder of Alder Brook Healing Arts in Eugene and Jill Simons of All's Well that Ends Well Colon Hydrotherapy in Portland. and opened her studio in October 2017. Colon hydrotherapy is a safe process which has been utilized for thousands of years to cleanse the colon. During the process the last five feet of the digestive tract, known as the large intestine or colon, is gently washed with purified water. At A Gentle Way Colon Hydrotherapy clients regulate the water flow and temperature themselves. Sessions last between 45 and 60 minutes. People choose to have colonics to detoxify their bodies; to prevent disease; to increase energy and well-being; to address specific digestive issues such as gas, bloating and constipation; to diminish food cravings; to aid in the clearing of parasitic infection, heavy metals and candida (a yeastlike parasitic fungus). As a healthcare advocate Galla aims to educate and support her clients' natural health needs. "You can see the difference in a person (before and after a treatment)," she said. "It's like having a fresh start." Many clients schedule colonics twice a month. Galla can discuss your health goals and help you determine a schedule. Many gastroentrologists are encouraging people have two colonics before a colonoscopy instead of the traditional preparation with laxatives. Though it can be an effective weight loss tool, Galla focuses more on the holistic health benefits of colon hydrotherapy. Colon hydrotherapy is not covered by insurance but Galla says sessions are affordable, and discounts are granted for multiple session purchases. "I am thrilled to be able to help people with not only digestive health (but) detoxification programs and overall well-being," she said. "This therapy helps so many people. Your gut is your emotional wheelhouse. When it works well everything else works more efficiently." To learn more about A Gentle Way Colon Hydrotherapy visit agentlewave.com or call 503-342-8704.